UMEX offers a wide range of fabrication services. We provide complete in house fabrication. This includes cutting, punching, drilling, tapping, welding, anodizing, painting, assembly and packaging. Precision cut lengths to +/- .003" tolerance at 20' lengths. 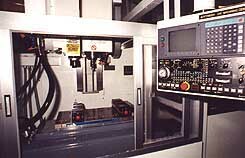 CNC machining to aerospace tolerancing. Digital optical capabilities on site.